David Bowie cast off his Ziggy Stardust persona decades ago, but a fondness for the look and sound of his 1970s music remains strong among rock fans. 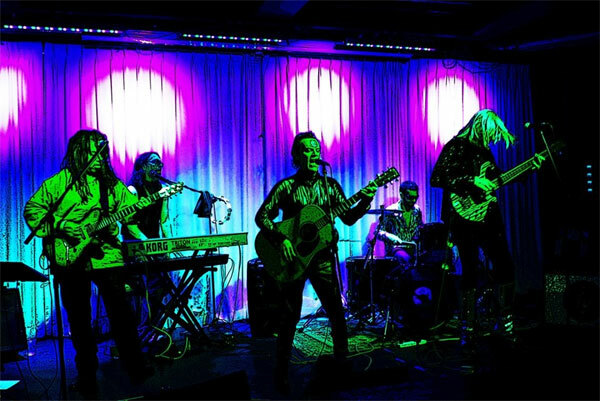 Asheville-based touring tribute group Wham Bam Bowie Band answers that demand. A one-off gig years ago in Nashville planted the seed that would eventually grow into Wham Bam Bowie Band. “We lived in Nashville from 1996 to 2000,” recalls leader Mark Casson. “In the late ’90s, there was a club where The Cheeksters played regularly, and we got friendly with the guy who booked shows there. He would put together theme nights, and he thought, ‘Maybe Mark could get together with these other two or three guys and do a David Bowie tribute.’” One of those musicians was Jerry Dale McFadden, now the keyboard player for The Mavericks; another was famed Nashville session guitarist Kenny Vaughan. Wham Bam Bowie Band came together in 2013, and has performed roughly 60-80 shows since starting. Keyboardist Aaron Price and guitarist André Cholmondeley – both musicians who are quite busy with other concurrent projects – were on board from the start, joined soon by bassist Brett Spivey. The newest member is drummer Jim Neu. Once they started playing shows, Casson’s Bowie tribute band focused first on what he describes as “that brash, early ’70s glam, proto-punk rock,” a far cry from The Cheeksters’ comparatively sophisticated and refined pop. Bowie’s landmark 1973 album The Rise and Fall of Ziggy Stardust and the Spiders From Mars provided the template for the Asheville band’s early sets. But Wham Bam Bowie Band quickly expanded their scope. Casson says that Bowie “is an incredible songwriter, and he’s covered so many types of music in unique ways.” So a current performance – like the upcoming Orange Peel show – first features the music of the entire Ziggy Stardust LP. “During a quick break, I effect a quick costume change,” Casson says. “And I’ll come back out as Bowie’s ‘Thin White Duke’ persona.” Then follows a second set of hits (and occasional deep-cut favorites) from throughout David Bowie’s nearly fifty-year recording career. The Britain-born Casson is excited about playing the relatively large venue of The Orange Peel in his adopted hometown. His message to those coming to the show is simple: “Expect to be transported – both musically and visually – back to the heady days of glam rock.” The Orange Peel show represents a unique opportunity. The band plays hometown gigs only occasionally, and this Friday night show is a (rare for the band) all-ages event. So Mark’s son Henry can come with his friends. At earlier shows, it was a case of Mark Casson being told, “Yeah, you can sneak the kid in, but only with a parent.” Now, a younger crowd can enjoy Bowie’s hits alongside those fans now in their 50s and 60s who bought the Ziggy Stardust LP when it first came out.